Chelsea City Hall is located at 305 South Main Street, Chelsea, MI 48118; phone: 734-475-1771. 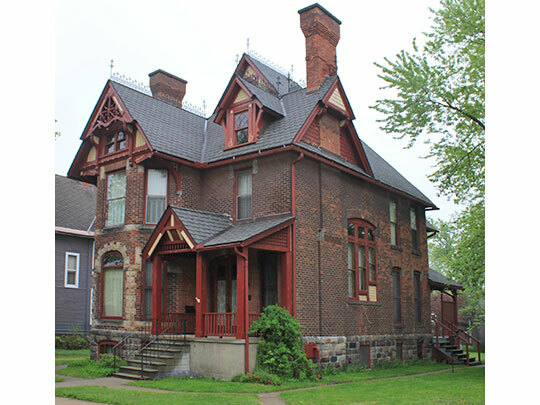 Photo: George W. Palmer House, 138 East Middle Street, Chelsea, Michigan. Listed on the National Register of Historic Places in 1996. Photographed by user:Dwight Burdette (own work), 2011, [cc-by-3.0 (creativecommons.org/licenses/by/3.0)], via Wikimedia Commons, accessed June, 2015. Chelsea, known as the "Vermont Colony" in the early 1800s, was originally platted in March of 1850, and consisted of six blocks—three blocks east and west of Main Street--an existing wagon road. The village plat was laid out to take advantage of the intersection of the Michigan Central Railroad and the north/south wagon route. Settlement of the area began in the 1830s with the arrival of Ann Arbor's Cyrus Beckworth, followed by a number of families from Addison County, Vermont. In 1834, two brothers from New England, Elisha and James Congdon, purchased land in the area and set up farms. Seeing a future beyond the farms, the brothers seized an opportunity with the relocation of the Michigan Central Railroad's freight station and offered their land. In 1850, the depot and freight house were erected on the east side of Main Street, at approximately the mid-point of the new village plat. The strategic location of the depot and added post office proved to be highly attractive to settlement. Settlers from the east (primarily New England and New York) and Europe soon made their home in the village. Chelsea developed into a successful trade center drawing traffic from Stockbridge and Manchester. Area farmers came to the village to pick up and drop off mail, purchase necessities and sell their farm surplus. The Village became the leading shipping point in the county for agricultural products, as well as the leading shipper of wool in the state due to a large number of sheep farms in the area. Following the establishment of the train depot, a blacksmith shop and hotel and saloon were constructed. The First Congregational Church was built in 1851, and by the end of 1852, the population of the village was 62 people. The first buildings along Main Street were constructed of wood, with awnings over wood sidewalks. In 1870 and 1876 fires destroyed the downtown first on the west side of Main Street, then on the east side. After the fires, the stores were rebuilt with permanent brick edifices. In 1880, Chelsea was chosen by the Michigan Central Railroad for an experiment in upgrading the appearance of rural stations—renovations included a cross gable roof with a modest flare at the eaves and simple cross-bracing adorning the gable ends. The depot served patrons of the Michigan Central until 1975 when the company was taken over by Amtrak. Amtrak discontinued service in 1981. The depot, a landmark around which the village developed, was purchased and restored by a group of local citizens. Over the years, Chelsea has evolved into a diverse community, with a mixture of housing, employment and industry, and has retained its "small-town" character. Often, small towns on the edge of large metropolitan areas tend to become bedroom communities, adsorbed by suburban sprawl. While Washtenaw County and the Ann Arbor area continue to grow, Chelsea has been fortunate to retain its individual identity as a unique community. The Village of Chelsea was incorporated as a city in 2004. City of Chelsea, Comprehensive Plan, 2008, www.city-chelsea.org, accessed June, 2015.